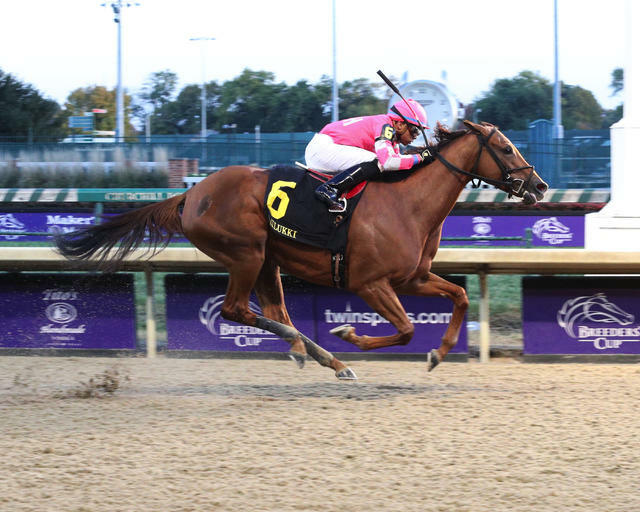 Corms Racing Stable and R. A. Hill Stable’s Chilukki Stakes (Grade II) winner Divine Miss Grey is the 122-pound starting high weight for Thursday’s 103rd renewal of the $200,000 Falls City Handicap (GII) – the centerpiece of a Thanksgiving holiday racing feast at Churchill Downs. The 1 1/8-mile Falls City for fillies and mares is scheduled as the 11th event at 4:22 p.m. (all times EST) on a 12-race program that begins with a special first race post time of 11:30 a.m. The undercard also includes the 45th running of the $100,000 Cardinal Handicap (GIII) for fillies and mares at 1 1/8 miles on the Matt Winn Turf Course, which goes as Race 9 at 3:24 p.m.
Divine Miss Grey (22-11-5-1—$807,672), a 4-year-old filly by Divine Park, rallied from just off the early pace in the Nov. 3 Chilukki to defeat four rivals as the 4-5 favorite for east coast trainer Danny Gargan. The Kentucky-bred filly previously finished second by 3 ¼ lengths in Belmont Park’s $400,000 Beldame Invitational (GI) on Oct. 6 after winning the $182,000 Dr. James Penny Memorial Stakes at Parx by 7 ¾ lengths in September. Jockey Tyler Gaffalione has the call on Divine Miss Grey in the Falls City and will break from the rail in the field of eight. Among Divine Miss Grey’s likely rivals is G. Watts Humphrey Jr. and Ashbrook Farm’s 3-year-old filly Skeptic, who most notably won the $106,000 Monmouth Oaks (GIII) in August. Based with trainer Rusty Arnold II’s Keeneland string, Skeptic broke her maiden in April at the Lexington, Ky. track by three-quarters of a length. The filly then won a first-level allowance on May 13 at Churchill Downs by 4 ¼ lengths under jockey Brian Hernandez Jr. She looks to rebound from an eighth-place finish in the Oct. 7 Spinster (GI) after being unprepared at the start. Skeptic (8-3-1-1—$167,806) will once again be ridden by Hernandez and break from post No. 4. Also entered in the Falls City is Iowa Distaff winner Dreamcall for owner Mike Rutherford and Hall of Fame trainer Steve Asmussen. The daughter of Midnight Lute will try to round back into form following non-competitive finishes in the Beldame and Royal Delta Stakes. Prior to that, she finished a close second to Berned in July’s Molly Pitcher (GIII) at Monmouth Park. Jockey Robby Albarado has the mount on Dreamcall (18-5-3-2—$301,484) who drew post 5. The complete Falls City Handicap field (with jockey, trainer and assigned weight): Divine Miss Grey (Gaffalione, Gargan, 122 pounds); Mannerly (Julien Leparoux, Brendan Walsh, 117); Dutch Parrot (Ricardo Santana Jr., Will VanMeter, 116); Skeptic (Hernandez, Arnold, 116); Dreamcall (Albarado, Asmussen, 119); Prado’s Sweet Ride (Florent Geroux, Chris Block, 118); Honor Ride (Corey Lanerie, Grant Forster, 114); Red Dane (Edgar Morales, Charlie LoPresti, 116). The Falls City dates back to the first racing meet in 1875 at the track then known as the Louisville Jockey Club. But unlike the Kentucky Derby Presented by Woodford Reserve (GI), the Longines Kentucky Oaks (GI) and Friday’s Clark Handicap Presented by Norton Healthcare (GI) – all of which made their debuts in that first local racing meet and have been run annually since – there have been some gaps in its renewals through the years. Through its history the 1 1/8-mile Falls City has provided a stage for both rising stars and fillies and mares who are preparing to end their racing days and embark on a new career in the breeding shed. Racing on Thanksgiving Day at Churchill Downs has been a Louisville tradition since 1969 where more than 7,000 turkey dinners are served with all the trimmings, making it the largest number anywhere in the region.